Sometimes in the early evening sky, before it glares in complete darkness, the Moon takes on a golden hue, well captured and exaggerated here in a handheld photo by the Apollo 16 crew. 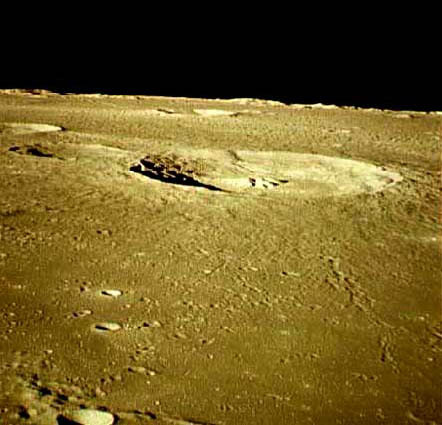 The low oblique shot provides a near-profile view of this 60 km wide crater. Can you identify it? The crater's relative freshness is indicated by its sharp rim crest, lack of superposed impact craters, and nice secondary crater chains. The rise of the rim above the surrounding mare is visible both topographically and by the radial ejecta streaks. And the collapsed terraces appear more like mountainous masses than when seen from above. Oh yes, the crater 5/6ths of the way to the horizon and seen as a nearly closed ellipse is Konig. Now can you identify the big crater? Tomorrow's LPOD: Don's Crater To Be? This page was last modified on 15 March 2015, at 14:30.